Highlights of this month include a trip to Wagga Wagga, a book launch and an indigo bath. 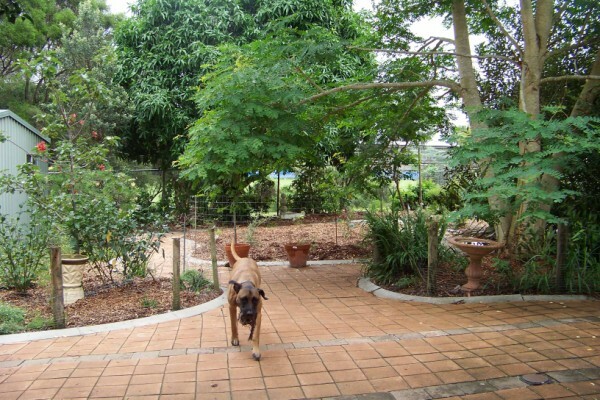 But first, Kaos has been very busy supervising the reconstruction of the back garden. Apart from putting in more grasses in pots we are finished. What good timing: all the rain we’ve been having will surely make it all grow. 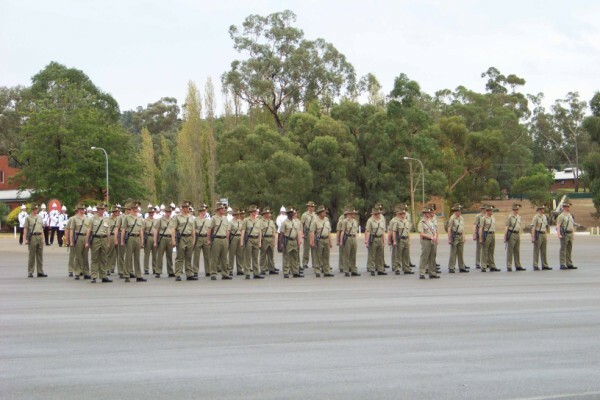 The trip to Wagga Wagga was for the Passing Out parade of our son, Andrew. He has joined the army and had completed his initial training. It was a very impressive occasion, lots of marching and pomp and ceremony. I was a very proud Mum and David would have been bursting out of his skin with pride. 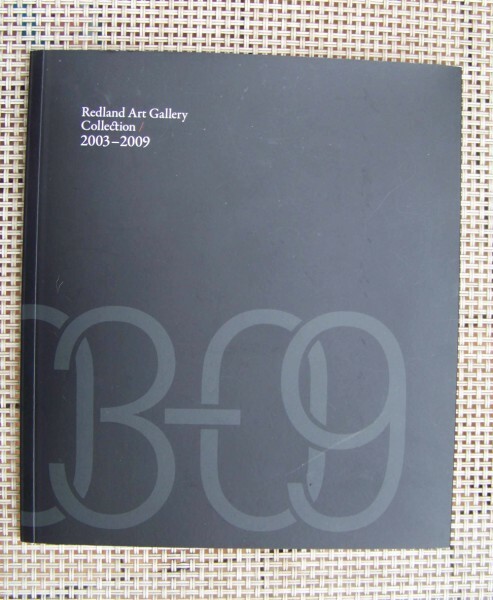 Redland City Council launched the publication of a catalogue of the work in its collection to mark 7 years of the opening of the Regional Art Gallery. My work, “Which Way” is listed in the category of “Photography and New Media”. This is the work currently on tour with “Twelve Degrees of Latitude”. Finally I got to do an indigo dye bath. I had been collecting various works to be dyed. They were all pulled up ready to go. The bath was made and then I started dunking. Some pieces had just a few dunks, others had up to 12. A comment on the actual bath: I used natural indigo as opposed to the synthetic version. I did find that I used much more natural to get the colour I wanted. The recipe I used came from Dana McCown and I have posted it in recipes. I am delighted with the results and the indigo bath is there for more dunking later as required. While I was in Washington DC and at the Textile Museum, I acquired a piece of cloth that was resist tied ready for dyeing from Nigeria. The way it had been tied resulted in a 3 conical form so I was fascinated to see what pattern I would get when it was undone. I am delighted with the result. I did use about 12 immersions to get to the colour I was happy with. 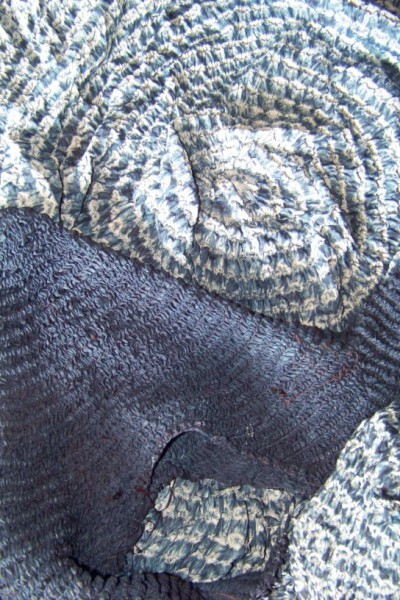 The scarf has three resists processes. The first was a warp resist and was used for devore. 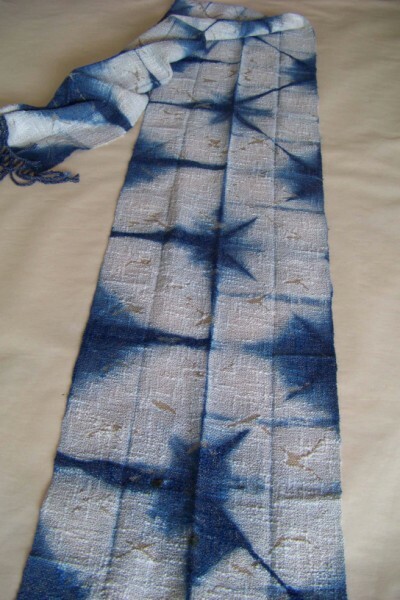 The second was a folded and clamped resist that was then dyed in indigo as was the third. It was also a different folded and clamped resist but a different format. I used 2 folded and clamped resists as I wasn’t totally happy with the first. The second set of folds aligned very nicely with the first. The yardage is woven damask in 5 end satin. It was woven on the draw loom with an additional set of shafts for warp resist. 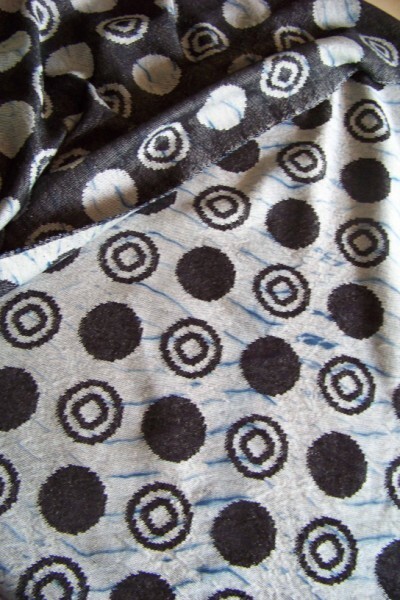 I was very happy with how it wove and the design has worked very nicely with the indigo resist pattern. Finally, I came across an interesting recipe in an old book, Hand Block Printing and Resist Dyeing. It is a recipe for finishing cotton cloth ready for presentation. It is a recipe for a sugar bath which “leaves the cloth soft and slightly silky”. I tried it on a piece of commercial fabric which I had already dyed. Rather than rely on my own preknowledge, I took the samples to the month’s Weavers Interest group at Qld Spinners and Fibre Artists. The results of my survey were of 17 people 2 couldn’t tell the difference, 11 thought the treated fabric was different and had more body and 5 thought the treated sample was “soft and slightly silky”. It will be interesting to try again, but this time with handwoven fabric. I have also posted this recipe separately. You are currently browsing the Kay Faulkner's Blog blog archives for March, 2010.